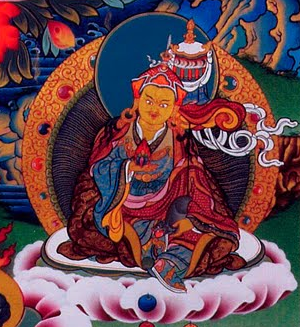 Lama Orgyen Khandro Norlha (Tib. བླ་མ་ཨོ་རྒྱན་མཁའ་འགྲོ་ནོར་ལྷ་, Wyl. bla ma o rgyan mkha' 'gro nor lha) ‘The Fertile Shower of Fulfilling All Wishes', is a wealth and prosperity practice based on Orgyen Norlha, the ‘Lama of All Dzambhalas’ form of Guru Rinpoche. In the Tsokye Tuktik terma cycle of Dudjom Rinpoche, which is the lama practice of the Three Roots of the Dudjom Tersar lineage, Lama Orgyen Khandro Norlha is the inner aspect of Guru Tsokye Dorje. This wealth and prosperity practice is strongly connected with treasure vase consecration. In this practice, the principal deity is Lama Khandro Orgyen Norlha, aka Orgyen Khandro Norlha, or Guru Dzambhala, who is Guru Rinpoche manifesting as the divine god of wealth surrounded by the assembly of wealth gods and goddesses. Guru Dzambhala, the Guru of all Dzambhala, is the embodiment of the perfect generosity of all buddhas and bodhisattvas in the past, present and future. According to the Dudjom Tersar lineage oral instructions, the Lama Orgyen Khandro Norlha practice can be practised as a daily practice, or as a drupchen, when it is the tradition to combine the accumulation of mantras with the consecration of treasure vases and with the making of Yang-Dzey Rilbu. The Lama Orgyen Khandro Norlha practice is part of the Tsokye Tuktik cycle of Dudjom Rinpoche, which was revealed as a gongter in 1929, in Tibet. In this cycle which focuses on the lama practice, it is the inner form of the lama. Due to unfortunate, inevitable coming events, many bad omens appeared all over Tibet in the late 1940’s. During that time, Zangdok Palri Lama Ling Monastery was damaged by earthquakes. Dudjom Rinpoche, however, continued to bury treasures vases, build stupas, and do ceremonies to restore and balance the earth energetic points where King Songtsen Gampo and many subsequent masters had built temples. In the West, the tradition of drupchen focused on Lama Orgyen Khandro Norlha has been implemented by direct students of Dudjom Rinpoche, such as Lama Tharchin Rinpoche and Dawa Chödak Rinpoche. ↑ Yang dzay rilbu (essential wealth substance pills) are the main substances in mother pills contained in treasure vases. ↑ Dudjom Sungbum, vol. 16. (ma), p. 611-618. ↑ Dudjom Sungbum, vol. 16. (ma), p. 619-622. ↑ Dudjom Sungbum, vol. 16. (ma), p. 623-624. ↑ Dudjom Sungbum, vol. 16. (ma), p. 625-627. ↑ Khenpo Tsewang Dongyal, Light of Fearless Indestructible Wisdom: The Life and Legacy of H. H. Dudjom Rinpoche, Snow Lion 2008.